Junk Food Jones: National Donut Day! Today is “National Donut Day”. I’m not sure who invents all these dumb fake holidays and gets them sort of semi-officially recognized but they deserve a dumb, fake, semi-officially recognized holiday of their own for coming up with this one. That’s because, unlike National Itch Day or National Impersonate Authority Day (both of which are also today so get your scratching finger warmed up and your police officer costume out (and also your bail money because that’s illegal)), National Donut Day can get you a free donut. Seriously. Several shops are offering them but the only one I’m going to mention by name is Krispy Kreme. That’s because here in Los Angeles, the Land of a Bajillion Donuts, Krispy Kreme is the only one who won’t screw you over with the chocolate iced cream filleds. Seriously, Los Angeles. Why can’t I reliably get a chocolate iced cream filled donut out here? All I ever find is chocolate iced custard filled. And the worst part is that the two look exactly alike from the outside. 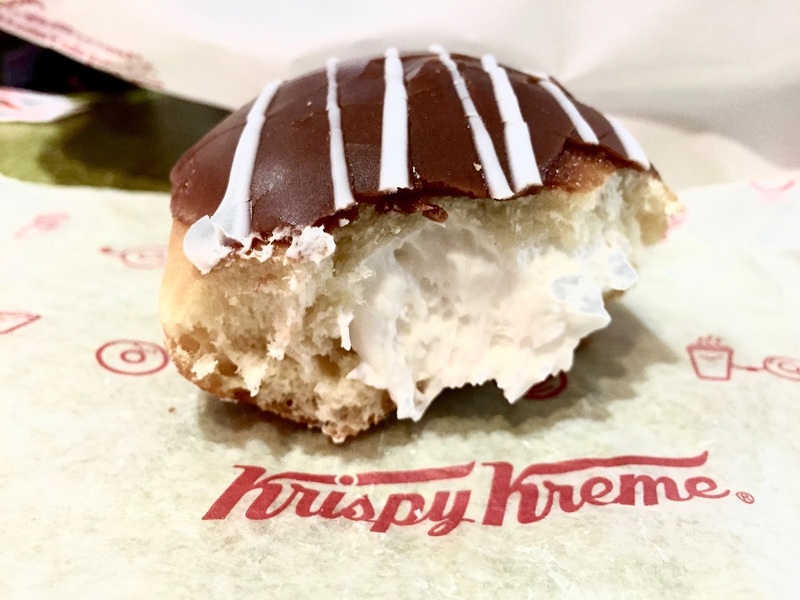 You never know you’ve been had until you’ve already bitten into it and your mouth is filled with slimy, snot-colored, gross custard rather than fluffy, bright white, delicious cream. And asking the person behind the counter doesn’t always help because, for some reason, people here don’t seem to know the difference. The terminology is off. Maybe it’s because the custard filled is sometimes called “Boston Cream” or “Bavarian Cream”. I don’t know but there should be a law. Those damned things must be clearly labeled! We’ve got a big election coming up in November. I need to know where the candidates stand on this issue. You want my vote, you've got to tackle the important stuff. Anyway, Krispy Kreme is the only place in Los Angeles that I’ve been able to reliably find a real cream filled donut so they get my endorsement on this most magical day of the year. Find one near you and ask for your freebie. Just stay away from the cream filled. Those are mine. By-the-way, notice how I didn't make a single hack dress-up-as-a-cop-eat-a-donut-joke even though I could have tied those two dumb fake holidays together? You're very welcome. Can You Steal a Horse With Ice Cream?